Hibs got back on the winning trail with goals from Danny Handling and Dominique Malonga giving them a second victory in two weeks against Alloa Athletic. Handling struck after 27 minutes but the home fans had to wait until 17 minutes from the end for Malonga to finally break the resistance of the Wasps who had spent the vast majority of the match on the back foot. Hibs made two changes to the side which went down to Falkirk, striker Malonga, who missed that match through suspension, and club skipper Liam Craig, who was prevented from facing his old club by a hamstring injury, replacing Paul Heffernan and Sam Stanton in the starting line-up. A minute’s applause to mark the death of former Hibs player John Baxter proceeded the match with the home players wearing black armbands in tribute. There was nothing in the opening stages to warm the fans on a bitterly cold day at Easter Road, Alloa making their intentions clear with a 4-5-1 formation which meant patience was going to be key for Alan Stubbs’ side as they sought a way to goal. They had to wait until the 21st minute for a glimpse, Handling’s well-weighted pass picking out Malonga but Wasps goalkeeper Craig McDowall had spotted the danger and came racing from his line to block at the Congolese internationalist’s feet. The incident did, though, spark a period of pressure from Hibs which eventually brought the breakthrough, the home side working the ball around until space opened up on the left for Jason Cummings to drill in a powerful low angled shot which McDowall couldn’t hold. The ball fell to Handling who, stretching, knocked it high into the net from six yards. McDowall kept his side in it as Scott Robertson made a surging run from midfield to meet a long ball, the goalkeeper managing to stand tall to thwart his opponent. 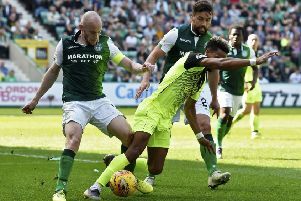 And McDowall did so again 12 minutes into the second half, clawing Scott Allan’s inswinging corner out from under his bar as it threatened to double Hibs’ lead. Hibs continued to retain a tight grip on the game but the home fans were becoming increasingly frustrated at their side’s failure to build on their narrow lead, Alloa content to concede corner after corner to keep Stubbs’ players at bay. But they were able to breath easily in the 73rd minute when Malonga threw out his right foot at a wayward shot from Robertson, managing to steer the ball beyond a bemused McDowall. Hibs: Oxley, Gray (Booth 56), Hanlon, Fontaine, Stevenson, S Allan, Robertson, Craig, Handling (Kennedy 76), Cummings (Heffernan 86), Malonga. Substitutes not used: Perntreou, Stanton, Jake Sinclair, Martin. Alloa Athletic: McDowall, Doyle, Gordon, Benedictus, Meggatt, McCord, Simmons, Docherty, Hetherington (Cawley 60), Spence, Ferns. Substitutes not used: Gibson, Holmes, Marr, Forsyth, Wilson.